Dental anxiety is real for many people of all ages. In fact, the fear of the dentist keeps many people from visiting the dentist and enjoying optimal oral health. The team at Munroe Falls Family Dentistry wants to help you overcome these fears, so you can enjoy a bright, healthy smile. Our entire practice is built around reducing dental anxiety through our relaxation dentistry practices. We don’t just say that we “cater to cowards,” we take the extra steps necessary to mean it. Read below all the ways we ensure your comfort and calm your fears while in our care. We schedule adequate appointment times. As simple as it sounds, providing people enough time to relax and adjust to their environment is critical to reducing their dental anxiety. Thus, we don’t overbook or rush appointments. We want you to have plenty of time to get comfortable and have your questions answered. If you’re especially anxious, we encourage you to let our office know when you call to schedule, so we can provide extra time if needed. Our dentists are gentle and go at your pace. Dr. Evan and Dr. Bartels put your comfort above all us when your visit Munroe Falls Family Dentistry. As a result, they will go at your pace. If you need to take a break, they are happy to oblige. Likewise, if you’re more comfortable doing fewer, longer visits, they will do their best to accommodate you. 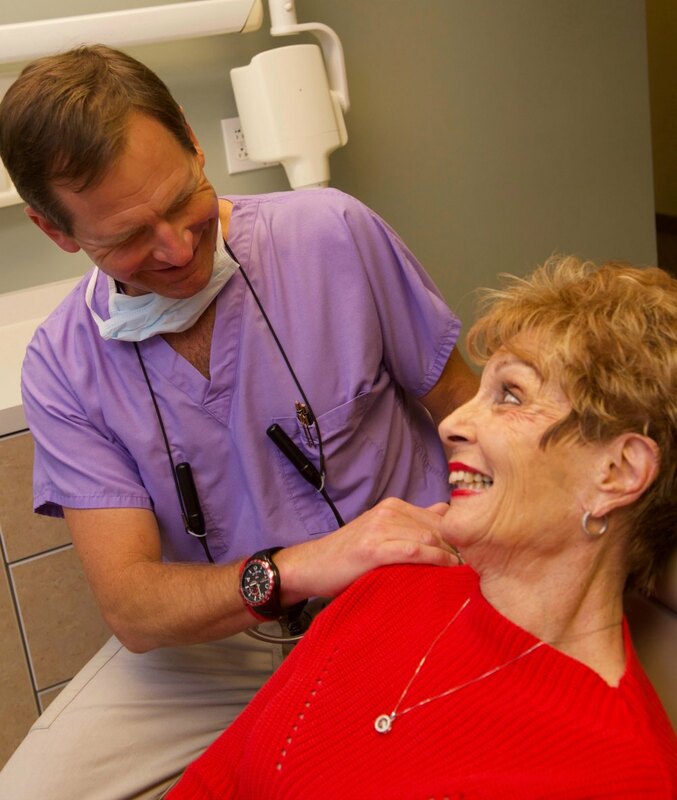 Our doctors believe in Dentistry by the Golden Rule—they treat each patient with the compassion and respect they would want to receive. This results in gentle care. Different aspects of dental visits trigger fear in different patients. For example, some find the noises of dental instruments unsettling. For these patients, we’re happy to offer earbuds and a music player to block out the dental noises. Others find that their anxiety makes them feel chilled. In this situation, our team members are ready with a soft, comforting blanket. Still, others may need the music and the blanket. In short, by comforting some of your senses, we can help turn down the level of anxiety you’re experiencing through our relaxation dentistry practices. We can provide gentle sedation with any and all dental treatments. 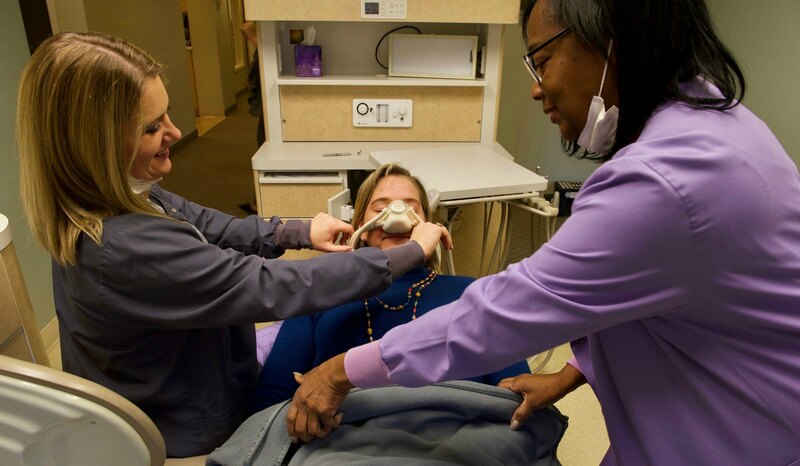 Even with sensory comforts and gentle dentists, some patients still need a little more help to calm their nerves. Hence, we can offer nitrous oxide with all dental procedures. Nitrous oxide is an odorless gas that when inhaled, helps people relax. Although you are fully conscious with this type of gentle sedation, you’ll feel less tense and worried. Some compare the feeling to having a couple glasses of wine. However, once we turn off the delivery of the gas, the effects quickly fade. As a result, you’re safe to drive yourself home after using nitrous oxide for your dental procedure. We are accepting new patients, no matter how long your fear has kept you from enjoying the benefits of regular check-ups. The MFFD team hopes you’ll call and let us help you overcome your dental anxiety. Whether it’s been 10 months or 10 years since you’ve been to the dentist, we want to help get you back on track to good oral health. Call our office at (330) 688-4942 to schedule a visit with us in our relaxing, judgment-free office. Dr. Evan, Dr. Bartels, and team are ready to help you conquer your dental fears.